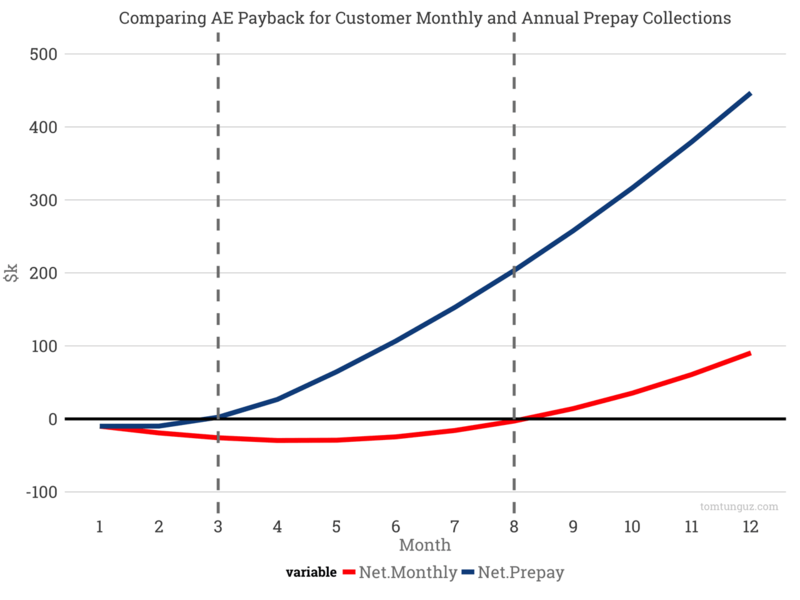 When we discuss payback periods in SaaS, we implicitly mean customer payback periods. How much time does it take for us to recoup the capital outlay we invest in acquiring a new customer? But, there’s a second and equally important payback period – the payback period on hiring a new account executive. Let’s take a hypothetical SaaS startup that sells a $20k product at a 75% gross margin. Clients pay monthly and commissions are paid monthly. The company hires a new account executive in month 1. The AE has an on-target-earnings (OTE) of $60k base/$60k commission and a quota of $600k. The AE is given 5 months to ramp to full quota: 0% in the first month, 25% the second, 50% in the third, etc. The chart above shows the cash flows associated with the hire. I’m assuming the AE attains exactly 100% of quota in each month. The company incurs $5k of expense in the first month, marked in red. This figure grows and stabilizes at $10k per month as the AE ramps and attains full quota. The positive cash flows in blue grow over time. These the collections from new business booked by this account executive. 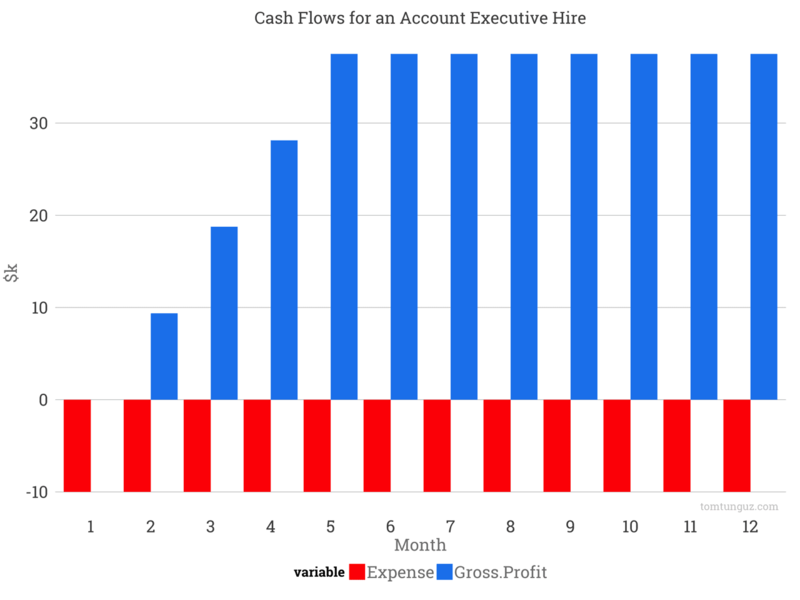 The investment in hiring this account executive breaks even on a gross profit basis in month 8. In other words, the business has collected enough cash from new customers sold by the AE to offset the training costs and compensation costs of the account executive. But the AE isn’t alone. The AE must be complemented with sales development, leads, and customers success to create a fundamental unit of growth. 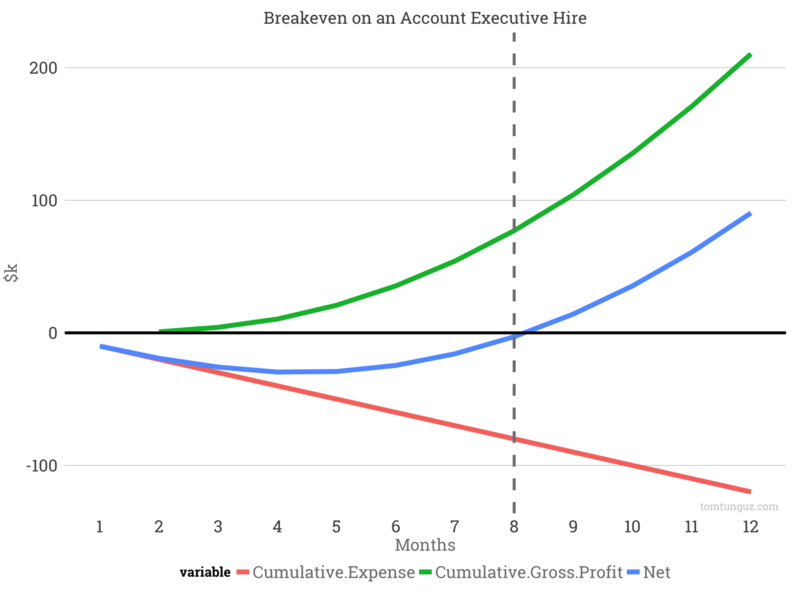 If we assume the AE needs 75% of the time of a sales development rep with lead generation at a salary of $60k, about 35 leads per month acquired at $5 per lead, and 30% of the time of a customer service rep also at $60k, then the breakeven time extends to 10 months. If we change the payment terms to annual prepay, then the breakeven period on the AE alone drops to three months. The chart above contrasts the payback on monthly v. annual plans on the AE alone. The fundamental unit, including the SDR and CSM, repays itself in five months. All the up-front cash coming in from new clients offsets costs very quickly. This analysis further supports the idea that SaaS companies should move to annual pre-pay, in addition to the cost of customer acquisition argument. Startups with annual prepay, strong sales training and sales operations can afford to hire salespeople more quickly because they can breakeven on the investment in less than half the time of competitors who collect cash monthly.